I love a hot lunch. With two still at home during the day, it gives me a reason to cook a hot meal, and this is one of their favorites. We call it “Real” Macaroni and Cheese, and while they love the flavor, they still pine for the orange boxed kind. Sigh. I’ve put the regular recipe below, but this can easily be made gluten-free by substituting GF flour and GF pasta (any shape will do). Tastes great either way! 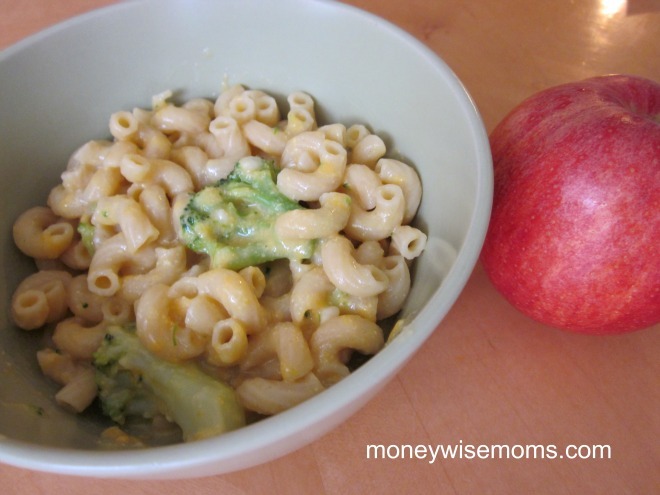 Cook the macaroni as directed, and just before al dente, add the frozen broccoli to the water. When broccoli is soft, strain all in a colander. Set aside until sauce is prepared. In a large saucepan, warm the milk over medium heat. Wisking constantly, add the flour and mustard and cook until the sauce thickens (make sure there are no big blobs of flour). Once the sauce is thick, turn off the heat and stir in both cheeses. Stir continuously until melted, then add the drained pasta/broccoli to the pot. Stir to coat the pasta. I usually serve this with crunchy apples as a nice complement to cheddar cheese, but a salad or raw veggies (carrots, celery, etc.) works too. This recipe is linked up to Beauty & Bedlam’s Tasty Tuesday, 22 Shades of Green’s Tasty Tuesdays, Home Sweet Farm’s Delectable Tuesdays, and Prairie Story’s Recipe Swap Thursday.